The three-time British Champion, GM Jonathan Rowson, steps up to play in the biggest tournament of his career after being given the wild card spot into ‘The Super Sixteen’ Grandmaster Rapid at the London Chess Classic, that runs 7-15 December at the Kensington Olympia. Two spots remain to be filled for the Super Sixteen, and two players will win their way there from the FIDE Open at the Classic. Rowson, 36, lives in London, but originally comes from Aberdeen, and is the Scottish number one. In 2004-6, he won the British title – the first Scot in 58 years to do so - and held the title for three consecutive years. He also won the 2000 Canadian Open Championship, tied for first in the 2002 World Open and was co-winner of The Hastings International Chess Congress in 2003/4. Outside of chess, Jonathan has degrees spanning a range of social science disciplines from Oxford and Harvard Universities, and a Doctorate examining the concept of Wisdom from the University of Bristol. He is currently Director of The Social Brain Centre at the RSA (Royal Society for the encouragement of Arts, Manufactures and Commerce) where he leads a range of research and thought leadership projects. He also writes at the Behavioural insights blog for the Guardian, has a weekly chess column for the Herald newspaper in Scotland, and has authored three critically acclaimed books on chess for Gambit Publications: Understanding the Grunfeld (1998), The Seven Deadly Chess Sins (2000), and Chess for Zebras (2005). The London Chess Classic showcases the hard work done by Chess in Schools and Communities, of how chess can be used as a very effective and invaluable educational tool in the classroom to help children with their school work. There has been a lot of global research done on chess in the classroom; and many academics agree that school chess simply works. 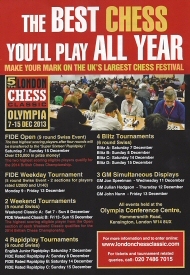 And today, we are pleased to announce that during the Classic, we will also be hosting the Chess and Education London Conference on the weekend of 7th and 8th December 2013 at the Olympia Conference Centre, Kensington. Titled “Successes and Challenges: Improving School Chess Practice, Research and Strategy,” the conference will bring together like-minded promoters of scholastic chess from Armenia, Sweden and Denmark, who will highlight the latest success stories of their work in the classroom, as well as recent research and commentary from eminent scientists, academics and authors. Over the two days of the conference, there will a mixture of workshops and lectures. The keynote speakers will be: Michelle Ellefson (University of Cambridge), Leontxo Garcìa (author and journalist), Aram Hajian (American University of Armenia) and Mads Jacobsen (Skoleskak Denmark). The registration fee is £125 GBP for both days, £75 GBP for one day but is free for CSC accredited tutors, education professionals from CSC schools and representatives of schools chess organisations and national chess federations. The full education conference programme is here. Delegates can also get to witness at first hand the UK’s largest chess festival, where they will see a mixture of chess events, from the world’s elite players in the ‘Super Sixteen to junior tournaments for children - and all under the one roof! And should they like to mix chess with the education conference, they can opt to play in one of our many tournaments. Online Entry for Festival Events now Open! Chess in Schools and Communities is delighted to announce that online entries are now open for the UK's largest chess festival. 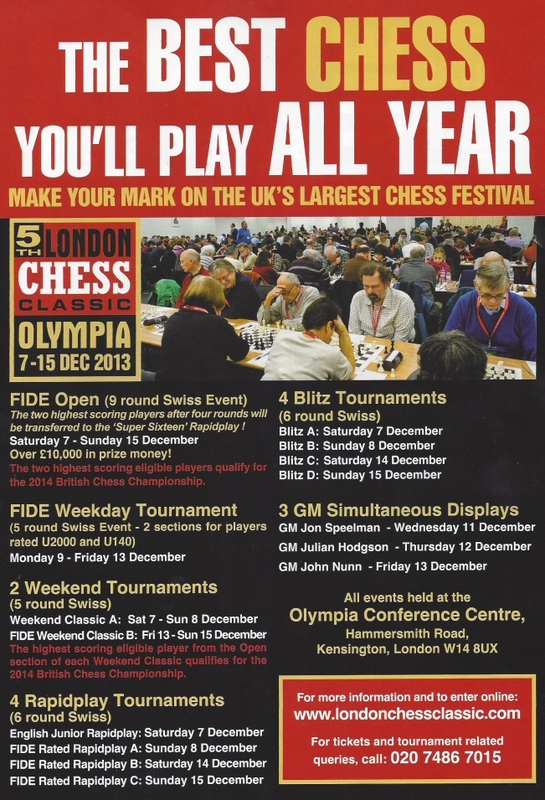 The 5th London Chess Classic will run Saturday 7th - Sunday 15th December 2013. 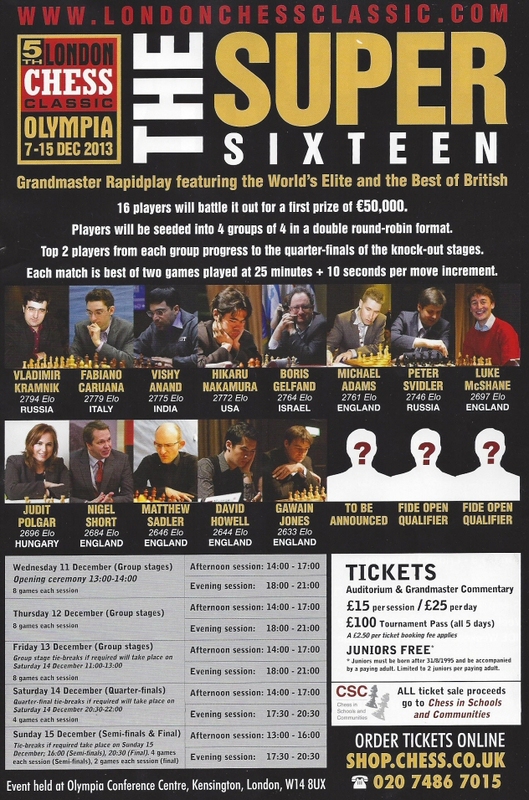 The marquee event is the ‘Super Sixteen’ Rapidplay featuring the World’s Elite and the Best of British. The festival also has events for all abilities and ages, with over £18,000 in prize money. In addition, there are blitz tournaments and Grandmaster simultaneous displays with former British Champions Julian Hodgson, John Nunn and Jon Speelman. All events will be held at the Olympia Conference Centre, Hammersmith Rd, London, W14 8UX. Win your way to the Super Sixteen! Chess in Schools and Communities is delighted to announce today a novel way for any chess player, of any rating, to have their dream come true and compete alongside the World’s Elite and the Best of British at the 5th London Chess Classic, running from Saturday 7th December to Sunday 15th December 2013. This year the LCC FIDE Open will qualify the two highest-scoring players after four rounds into the ‘Super Sixteen’ Rapidplay that features an all-star cast headed by World Champion Viswanathan Anand and the former champion Vladimir Kramnik. If more than two players are tied at the end of round four, the spots will be decided on a rating tie-break (the two players with the highest rating going forward). Anyone transferred will not lose out financially, as the lowest prize in the Super Sixteen is equivalent to the top prize in the FIDE Open. This means there are now 15 spots accounted for in the Super Sixteen. And we are also announcing today that the final slot will be decided by a ‘Wild card’ selection to be announced by the organisers of the London Chess Classic in late November 2013. The London Chess Classic FIDE Open is fast becoming one of the must-play Swiss Events on the international calendar - and this year, it will have a bumper prize-fund of over £10,000 (! ), as well as the guaranteed participation of a minimum of 12 Grandmasters. 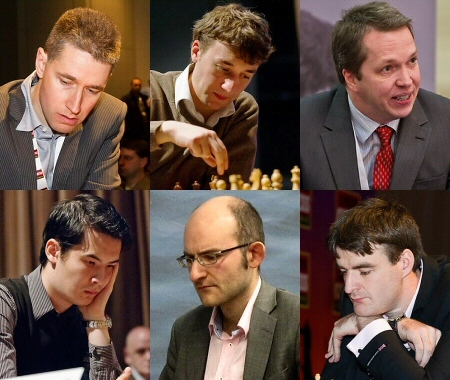 The 5th London Chess Classic will again be the largest Chess Festival held in the UK. Apart from the headlining Super Sixteen and the FIDE Open, there will also be a smorgasbord of side events catering for players of all ages and all ratings: a FIDE Weekday Tournament, 2 Weekend Tournaments, 4 Rapidplay Tournaments, 4 Blitz Tournaments and 3 Grandmaster Simultaneous Displays from past British Champions Julian Hodgson, John Nunn and Jon Speelman. It promises to be the best chess you’ll play or see all year! The 5th London Chess Classic will run from Saturday 7th December to Sunday 15th December at the Olympia Conference Centre in Kensington. Click for more information and to enter online. For ticket and tournament related queries, call our hotline now: 020 7486 7015. 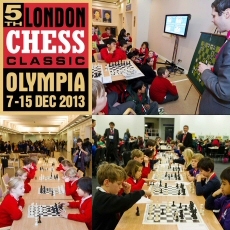 Chess in Schools and Communities is delighted to announce today that the six leading English players, Michael Adams, Luke McShane, Nigel Short, Matthew Sadler, David Howell and Gawain Jones have accepted their invitation to play in the 5th London Chess Classic to be staged at the Olympia Conference Centre in Kensington, running from Saturday 7th December to Sunday 15th December. Life begins at 41 for the UK No.1, Michael Adams, who was one of the world’s best players in the 1990s. He was a four-time semi-finalist (1993, 1997, 1999 and 2000) in World Championship events, and in 2004 he made it to the final. He was ranked No.4 in the world in 2001 and 2002, but by 2009 had dropped to No.50. Since then, the popular Cornishman has seen a renaissance in his game with a return to elite status; and this summer, he scored the biggest tournament victory of his career by winning the Sparkassen Chess Meeting in Dortmund, Germany, ahead of a field that included Vladimir Kramnik, the former world champion and world No. 3, and Fabiano Caruana of Italy, who is ranked fifth. Luke McShane, 29, and Matthew Sadler, 39, both follow in that quaint English tradition -- much like C.H.O’D Alexander and Jonathan Penrose, who shocked top Soviet stars such as Botvinnik, Bronstein and Tal -- by being regarded as the world’s top two amateur players, as they hold down very demanding full-time professional jobs. McShane works in finance in the City, and Sadler in IT in The Netherlands - but while chess is now a “hobby” for both, the English No’s. 2 and 4 respectively still play to a very high standard. Globe-trotting Nigel Short continues to add further successes to his long list of tournament victories, with this summer seeing the English No.3 share first prize in the Sigeman Invitational in Malmo, Sweden, and first on tiebreak in the Canadian Open Championship in Ottawa; and, on both occasions, ahead of talented younger rising stars. Short, 48, consistently performs at or close to the elite GM 2700 rating level, as he fights off younger rivals by using his wealth of experience from a glittering career whose peaks include victory at the VAS Amsterdam tournament in 1991, ahead of Garry Kasparov and Anatoly Karpov, a Candidates match victory over Karpov in 1992 and a world title challenge in 1993 to Kasparov. Short is also in demand as an online commentator for some of the world’s top tournaments -- but we are always glad to see him play! David Howell, 22, and Gawain Jones, 25, are, respectively, the English No. 5 and 6, and also the last two winners of the British Championship titles - Howell storming to victory this summer in Torquay, for his second title (which he dedicated to his late father), and Jones, winning last year in North Shields. Both represented England at the very top at junior level, and have now become a regular fixture for their country at Olympiads and European Team Championships. 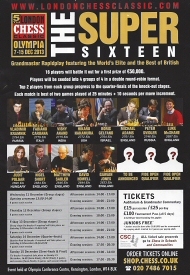 Adams, McShane, Short, Sadler, Howell and Jones will be cheered on by the patriotic home crowd expected to fill the Kensington Olympia, as they go into battle in the 5th London Chess Classic with the tough elite opposition of World Champion Vishy Anand, World Cup winner Kramnik, Caruana, Hikaru Nakamura, Boris Gelfand, Peter Svidler and Judit Polgar. The composition of the remainder of the 16-player field will be announced next week. 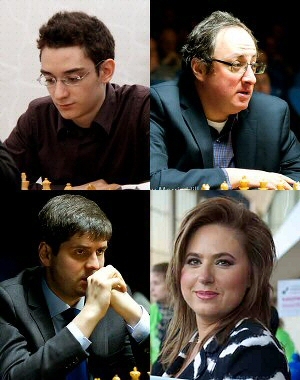 Chess in Schools and Communities is delighted to announce that another four international stars, Fabiano Caruana, Boris Gelfand, Peter Svidler and Judit Polgar have accepted their invitation to play in the 5th London Chess Classic to be staged at the Olympia Conference Centre in Kensington, running from Saturday 7th December to Sunday 15th December. Fabiano Caruana, 21, is the Miami-born, Brooklyn-raised former chess prodigy who beat Bobby Fischer’s record of becoming the youngest American grandmaster. He holds both Italian and American citizenship, and plays under the Italian tricolour. In the last year or so, so, Caruana has burst onto the elite stage with some superb results. Currently, he is ranked World number five on the September 2013 FIDE rating list. Boris Gelfand, 45, is the Belarus-born Israeli grandmaster who, nearly a quarter-century ago, became a World Top 10 player and qualified for a number of World Championship Candidates events. But just when everyone thought his best days were behind him, he made a dramatic comeback to win the Candidates to challenge Vishy Anand in last year’s World Championship match, where he lost in the play-offs. And his Indian summer continues: this year, he tied for first in the Alekhine Memorial in Paris and St. Petersburg followed by clear first at the Tal Memorial in Moscow. Peter Svidler, 36, is the erudite and popular St. Petersburg grandmaster, former World Cup winner, and multi-time Candidates qualifier with a record-breaking six Russian championship titles to his name. But he’s not your stereotypical Russian grandmaster, because Svidler is a big cricketing fan who owns a complete set of the cricketer’s almanack Wisden, and once had a letter read out by Henry Blofeld on the BBC’s Test Match Special. Judit Polgar, 37, from Budapest, Hungary is a phenomenon in the game. At the age of 15, she broke Bobby Fischer’s near 30-year record for becoming the youngest Grandmaster. Polgar is the best woman player of all time and the only woman currently in the world’s Top 100. At her peak she was in the Top 10 and would regularly do battle in Super GM tournaments with the likes of Kasparov, Karpov and Anand. Caruana, Gelfand, Svidler and Polgar now join World Champion Vishy Anand, recent World Cup winner Vladimir Kramnik and the US No.1, Hikaru Nakamura to have confirmed they will play in the 5th London Chess Classic. The rest of the 16-player field will be announced early next week. Chess in Schools and Communities is delighted to announce today that GM Vladimir Kramnik, the recent Fide World Cup winner in Tromsø, Norway, has accepted his invitation to play in the 5th London Chess Classic to be staged at the Olympia Conference Centre in Kensington, running from Saturday 7th December to Sunday 15th December. London has become a happy hunting ground for Kramnik. Not only has the former World Champion been a regular at the London Chess Classic, winning the 2011 edition, and runner-up twice (behind Magnus Carlsen, the World No.1, on both occasions), in 2009 and 2012, but in 2000, London was also the venue for his historic world title win over Garry Kasparov. Earlier this week in Tromsø, Kramnik showed he’s still a major force in the game with his easy victory in the four-game Fide World Cup final over the current Russian champion, Dmitry Andreikin; that will see both qualify for next year’s Candidates’ tournament. And Kramnik’s overall performance in the World Cup, also saw the former World Champion once again reclaiming the World No. 3 spot in the September Fide rating list published this week. 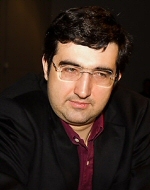 Kramnik now joins World Champion Vishy Anand and the US No.1, Hikaru Nakamura as the the third player to have confirmed they will play in the 5th London Chess Classic. The rest of the 16-player Rapid field will be announced in the coming week. Chess in Schools and Communities is delighted to announce the 100 day countdown is underway for the 5th London Chess Classic to be staged at the Olympia Conference Centre in Kensington, running from Saturday 7th December to Sunday 15th December. 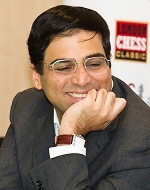 Due to a demanding elite-player schedule through 2013 -- that will culminate with the World Championship match in Chennai, India between Vishy Anand and Magnus Carlsen set to end on November 26th, and the World Team Championship in Antalya, Turkey on 6th December -- this year the Classic will be headlined by a world-class Rapid tournament (25 minutes + 10 seconds per move) that will start on Wednesday 11th December and finish on Sunday 15th December. This will feature a 16-player field split into four groups, with the top two from each group qualifying for the quarter final knockout stages. Scoring will be 3 points for a win, 1 for a draw, 0 for a loss. The total prize fund on offer will be €150,000 - the full breakdown being: 1st €50,000; 2nd €25,000; 3rd-4th €12,500; 5th-8th €6,250; 9th-16th €3,125. And the first two players to sign up for the 5th Classic are both big crowd-pleasers: World Champion Anand and the US No.1 Hikaru Nakamura. 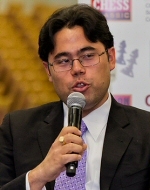 Anand (with or without the world crown) will be heading to London immediately after his title match with Carlsen, and Nakamura not long after playing in the Sinquefield Cup -- along with Carlsen, Aronian and Kamsky -- in St Louis, one of the strongest tournaments ever to be held in America. Over the next two weeks, the rest of the field will be announced as player contracts have been signed and approved. The schools events will be expanded and the festival, with weekenders, FIDE Open, simultaneous displays and lectures will all take place as usual -- but look out for what could be a novelty twist to the FIDE Open! The smorgasbord of chess at the London Classic will also include Pro-Celebrity Chess, Blindfold Chess and Chess 960. Tickets will go on sale in September after the field has been finalised. Tickets will again be free for children. I am delighted to announce that the 5th London Chess Classic will take place at Olympia from Saturday December 7th to Sunday December 15th. The 5th Classic will not feature top level Classical Chess, but it will be headlined by a world class Rapid tournament as well some celebrity contests if I can find some celebs that are brave enough. The switch to Rapid is because Vishy Anand and Magnus Carlsen will doubtless be very tired so soon after the conclusion of their world title match at Chennai which is scheduled to end on November 26th. The schools events will be expanded and the festival, with weekenders, FIDE Open, simultaneous displays and lectures will take place as usual. The FIDE Open will probably act as a qualifier for the main event and there will be some Blindfold Chess and Chess 960 so it should be an all round chess extravaganza. Tickets will go on sale in September after the field has been finalised. The venue will again be Olympia. Please watch this site for more information including the festival entry form. Latest developments will be posted on Twitter via @londonclassic. Once again there’ll be a cutting edge live broadcast and I’m looking forward to welcoming you to the biggest Classic ever.